Hard as it is to believe, there was a time when few NFL teams featured a logo or decoration on their helmets. At the dawn of the 1960s, only four of the league's twelve teams—the Baltimore Colts, Los Angeles Rams, Philadelphia Eagles, and the Washington Redskins—wore something other than a blank helmet. Today, there are several reasons why every NFL team (with the notable exception of the Cleveland Browns) features a decoration of some sort on their lids. Reason number one is aesthetics. The Rams became visual pioneers back in 1948 when running back Fred Gehrke hand-painted ram horns on his team's leather helmets. Reason two is television, and reason three would be licensing. In a span of a few short years, TV broadcasting and licensed merchandise would conspire to necessitate the development of distinctive and discreet team logos. The explosive growth of television in the 1950s gave rise to a renewed emphasis on sports graphics and uniform design. The National Football League’s 1958 Championship Game, which pitted the Baltimore Colts against the New York Giants, was the turning point in catapulting the NFL to the top of America’s sports heap. Despite being blacked out in the New York City area, the game was viewed by an estimated audience of 45 million Americans, a huge number when one considers the fact that the entire population of the United States then was approximately 175 million people. Three years later, Congress enacted the Sports Broadcasting Act of 1961, which ruled that leagues could effectively negotiate their own group television contracts (prior to this, individual teams negotiated individual broadcast deals.) 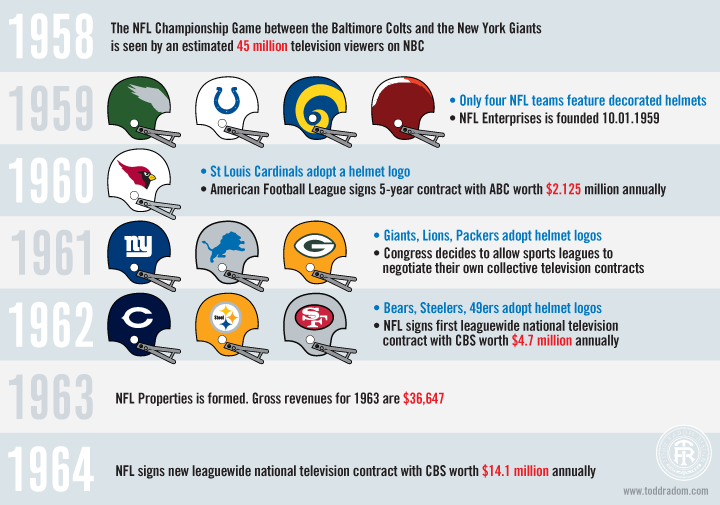 In 1962 the NFL scored its first national television contract, worth $4.7 million annually. Television was king, and teams needed visible logos in order to differentiate themselves. Modern sports licensing was being born at the same moment. In 1959, an executive at Roy Rogers Enterprises, Larry Kent, contacted Los Angeles Rams general manager Pete Rozelle, about marketing Rams team merchandise through the "Roy Rogers Corral" at area Sears stores. Roy Rogers was Hollywood's "King of the Cowboys." He was also the face behind a licensing powerhouse. Rogers started his merchandising arm in the early 50s. Within a couple of years Roy Rogers Enterprises was producing an 80-page catalog of officially licensed merchandise, grossing $35 million annually. Rogers and the league formed NFL Enterprises in October 1959 as a subsidiary of Roy Rogers Enterprises. Rogers received half the revenues, with NFL team owners splitting the rest of the pot. Their first venture was a deal with Standard Oil in the form of glassware with team logos, given away with fill-ups at Standard gas stations. A 1998 Sports Illustrated articlesaid that "(w)ithin a year Rogers had lined up 45 manufacturers, churning out about 300 NFL products—cigarette lighters, dolls, vacuum bottles, ties, blankets, coats, pajamas and more. The strange marriage between branding iron and gridiron, however, didn't last. When the contract came up for renewal in 1962, Kent leaped from Roy Rogers Enterprises to the burgeoning NFL." By then Rozelle had been elevated to NFL Commissioner. In 1963 the owners of the league's 14 teams agreed to assign all rights to their team's trademarks, thus forming NFL Properties. Things started out a bit slowly, with gross revenues that year coming in at $36,647. Today the NFL generates more than $3.2 billion a year in sales of licensed merchandise. The dual influences of television and merchandising in the early 60s are borne out in the fact that more than half of the old-guard NFL franchises added helmet logos between 1960-62. Unless you're from Cleveland, it's difficult to imagine a world without logos on NFL helmets. Broadcasting, licensing, and the King of the Cowboys helped shape this perception, even before the Cowboys—the Dallas Cowboys—bolted NFL Properties and decided to take back their own brand and go it alone. Which is another story for another day.